Compare laundry liquids in New Zealand at Canstar Blue. Surf, Coldpower, Earthwise, Ecostore, and Persil were compared on value for money, quality of clean, environmental friendliness, scent, feel of clothes after wash, packaging and overall satisfaction. Laundry powder may still be the most popular type of washing detergent on the market but for some the nasty job of removing clumps of it from inside a finished wash is just too much to handle. Obviously, we’re just jumping to conclusions here, but whatever their reason for using it, some people do prefer laundry liquid as opposed to powder. But what do people like about their laundry liquid and what makes them go back for more? After all, we are creatures of habit with 46% of people always buying the same brand. We recently (March 2018) asked 389 laundry liquid users what they thought and what they liked about their detergent. Your favourite top or shirt with a nasty stain right down the front is never a good look. What’s worse is when you’ve put it through the wash and the stain still sticks like glue. Wanting our clothes to come out of the washing machine looking cleaner than when they went in is probably why quality of clean also rated as one of the most important features we look for in our detergents. But it’s not just a nice clean look we’re after, we want our newly washed clothes to feel good to. After all, no good having a beautiful clean white shirt if it’s so crisp you crunch every time to you move! 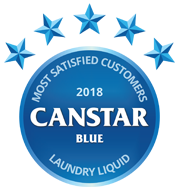 The Canstar Blue Overall Customer Satisfaction Winner Surf, were the only brand to take a maximum five stars in both of quality of clean and feel of clothes with Persil the only other brand to come close registering five star for quality of clean and four stars for scent. Whatever we are having to splash out on, we always like to think we’re getting bang for our buck and it’s no different when it comes to our laundry liquid. If you do have one eye on the price tag, Earthwise took the five star honours in this category with Surf and Coldpower being awarded four stars apiece. 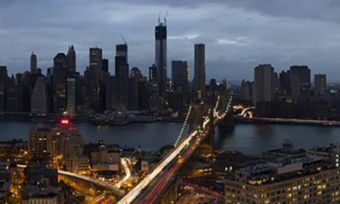 The remaining brands all received three stars. There has been a lot of scientific research conducted around what and how we smell and the upshot is that it’s thought we can smell over a trillion different odours. The base products in many laundry liquids don’t give off the sweetest aroma and some brands contain some pretty stinky chemical so for this reason, manufacturers often add a bit of something nice that will give our clothes a hint of something gorgeous. 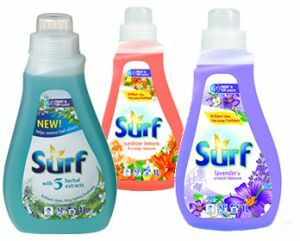 With exotic bouquets including tropical lily and ylang ylang or sunshine lemons and orange blossom, Surf was the only brand to achieve five stars in this category. Laundry liquid is great in the washing machine but not so good if it spills all over the floor! We think it’s fair to assume that robust, easy to store, easy to open, easy to pour packaging, would be what consumers are after. Both Surf and Earthwise scored a maximum five stars in this category. Persil and Coldpower scored four and Ecostore scored three stars. Nearly 40% of the people we spoke to said that they prefer to use an environmentally friendly product but unfortunately all of these amazing cleaning powers and beautiful fragrances we want come at a price – usually a chemical one. Some manufacturers have made a real conscious decision to step away from chemicals wherever possible, substituting many of them with plant-based compounds. With the philosophy that we can all make a difference, Earthwise, were the only brand to score five stars. Ecostore scored four stars with all other brands resting on three stars. So, there you have it. Not quite everything you’ve ever wanted to know about laundry liquids but hopefully enough to help you choose a one that’s right for you. Canstar Blue commissioned I-view to survey 2,500 New Zealand consumers across a range of categories to measure and track customer satisfaction. The outcomes reported are the results from customers who have purchased and used laundry detergent (liquid) in the last 3 months – in this case, 389 New Zealanders.